News has just crossed our desks that the USS Intrepid had been pried loose from the mud at its Hudson River dock and is heading for a $110 million renovation. This Essex-class aircraft carrier served in World War II, the Korean and Vietnam Wars and fought in every major battle prior to Japan's surrender in 1945. In the 1960s, she recovered the spacecraft from the Mercury and Gemini programs. Since 1982 has been part of the Intrepid Sea-Air–Space Museum in New York City. 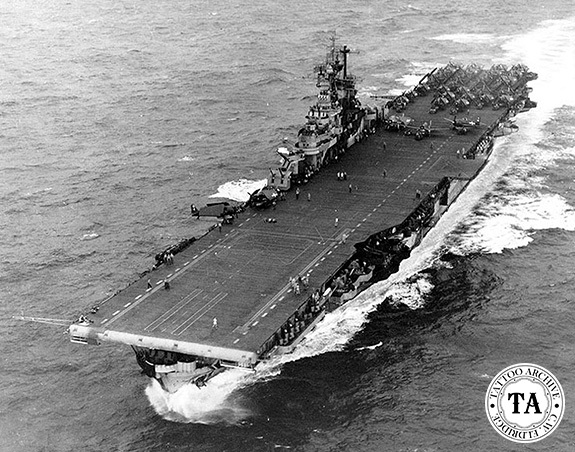 The Intrepid Aircraft Carrier was launched in 1943 in Newport News, Virginia and by January of the following year she was in Pearl Harbor preparing for the invasion of the Marshall Islands. By February of that same year the Intrepid took the first of her many hits with an aerial torpedo to her starboard quarter. After repair stops at Pearl Harbor and Hunters Point in California, she was back in fighting trim by June 1944. She was in and out of US repairs facilities many times before the war was over. As a matter of fact, the Intrepid survived five kamikaze attacks and lost 270 crewmembers. The Pacific War saw her fighting in the Philippines, Okinawa, Formosa, Wake Islands and more. In 1947 she was decommissioned and joined the reserved fleet, but she was not out of action long because in the 1950's she was commissioned and converted to a modern attack carrier in Norfolk, VA. These modern features included steam catapults and a reinforced angled flight deck. The 1960's found the Intrepid involved with the space program. In the days before the space shuttle, astronauts would land at sea and be rescued by ship. That ship would often be the Intrepid. The mid 1960's found the Intrepid with the Pacific Fleet off the coast of Vietnam where, as in World War II, she served with distinction. In the mid 1970s plans called for the Intrepid to be scrapped after decommissioning, but thanks to the Intrepid Museum Foundation the carrier was saved and was established as a museum ship. In 1986 the USS Intrepid was officially designated as a National Historic Landmark. What a long and colorful history! 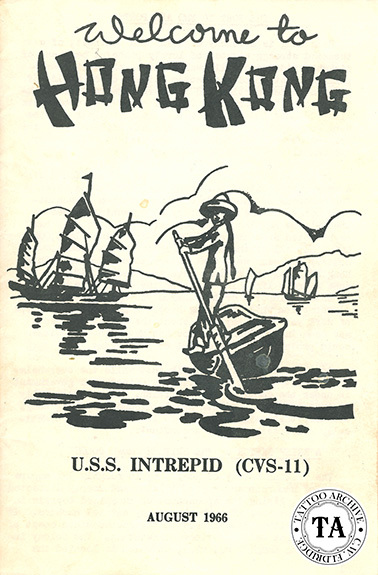 In 1966 when the USS Intrepid visited Hong Kong, a small handbook was printed for the sailors on board giving the history of the island, listing restaurants, hotels and other attractions. 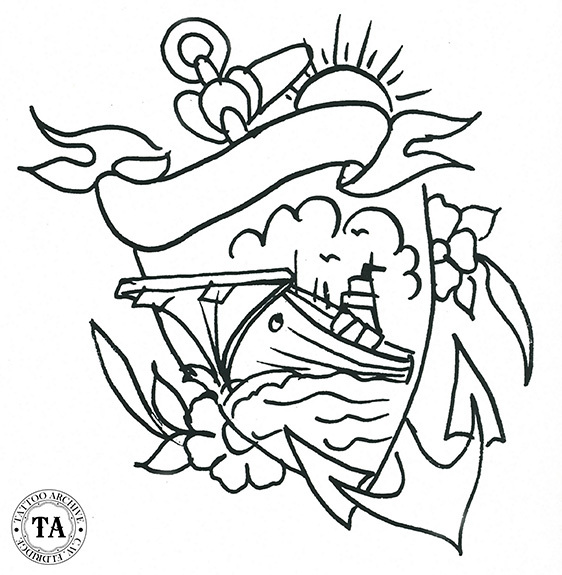 In the section "Additional Hints for Liberty", under the heading "Tattoos" the booklet stated, "Don't !! The transmission of syphilis by tattooing instruments is a Definite Possibility." The designs on the tattoo shop wall reflect the realities on the street. 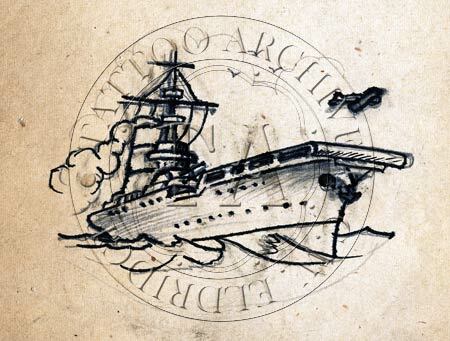 So when the aircraft carriers came into the US Navy, the tattooist simply updated their ship designs to show this new reality.